Heat oven to 375°F. Spray large cookie sheet with cooking spray. Unroll dough; press to 12x8-inch rectangle. Spread butter evenly on dough, all the way to edges. In small bowl, mix remaining ingredients. Sprinkle evenly over dough. Fold dough in half crosswise. Cutting from short side, cut dough into 8, 1-inch strips. Twist strips 3 times. Place on cookie sheet. Bake 8 to 10 minutes or until golden brown and crisp. 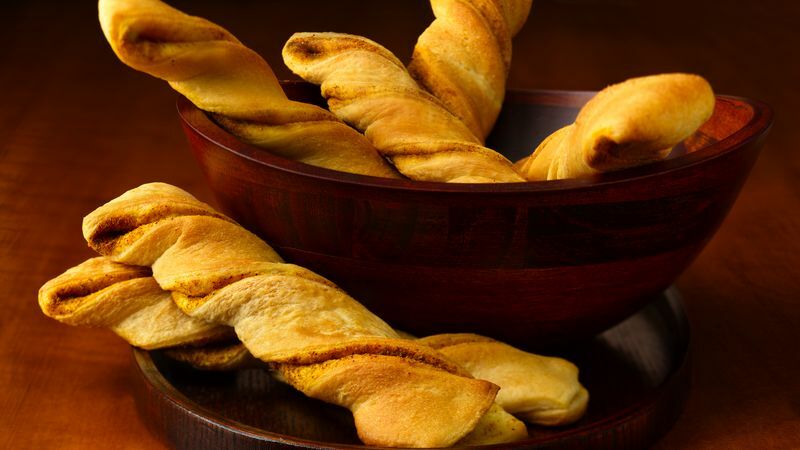 Add spicy twists to your next appetizer buffet, and serve with a fruity chutney or hummus.